2 diesel YANMAR 6LT-STE engines from 1975. no hour counters but approx 1000 hours each according to the owner. VICTRON CENTAUR 12 V / 600 Amp. battery charger TECSUP 12 V / 25 Amp. This Chris Craft Commander 38 was the first model to be built in GRP serie by the yard in 1967.
, comfortable seating on both side, (the one on starboard could be used as a single berth (80 x190 cm). Forward is a double berth cabin, (170x190). Electric Heads, shower and basin on port side. a 60L black water tank on board. Good headroom of 185 cm everywhere in the boat. Aft deck or cockpit is the second area of that boat, including an outside helm, a galley (micro wave oven, sink, and a trimixte fridge. Note there is no gaz on board, but the piping are still in place. Aft deck with a huge outside saloon big enough for entertaining 12 guests. On the forepeck, a large deck for sun bathing. 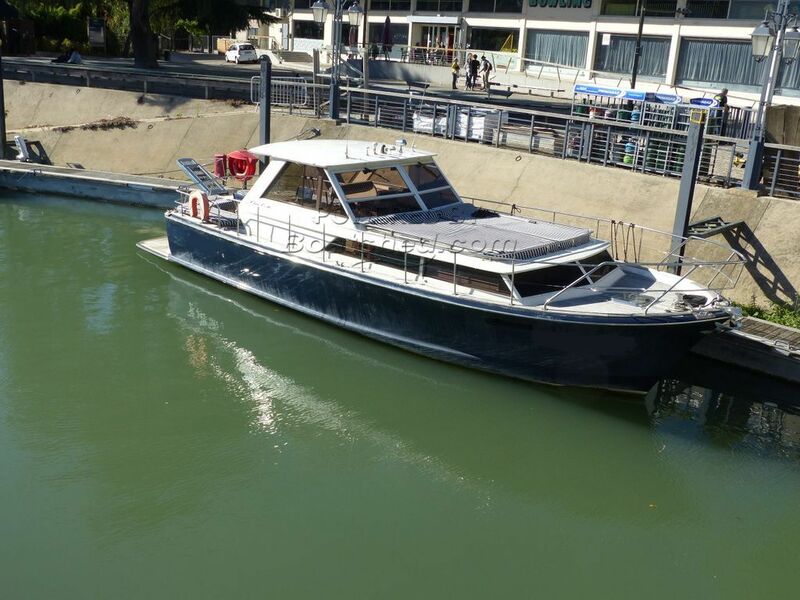 A river and maritime motor cruiser for sale in France. Boatshed Paris is happy to offer this Chris Craft Commander 38 for sale in Paris area. A great example of an American vintage motor boat currently used and certified as a passenger vessel and well looked after. Built in 1967 by Chris Craft currently used as a passengers vessel near Paris with all the certification up to date for carrying 12 passengers plus crew. Under French maritime registration the vessel however is equipped with river and costal equipments. Well maintained and professionally looked after this vessel is always appreciated by the customers and generate lots of booking. Passenger vessel certificat is valid until 08/08/2019.